Doug's latest book comprises a fascinating mélange of reports, both official and from newspapers, photographs, surveys, reminiscences and writings from a myriad of sources relating to the Wilts and Berks Canal from its beginnings to the present day, ranging from a newspaper article from 1817 extolling the advantages of the canal to Wantage via an official report by Berkshire County Council in 1908 upon the canal which, by then, had fallen into desuetude, to his own report of the opening of the sackhouse on Wantage wharf as a museum in 2014. 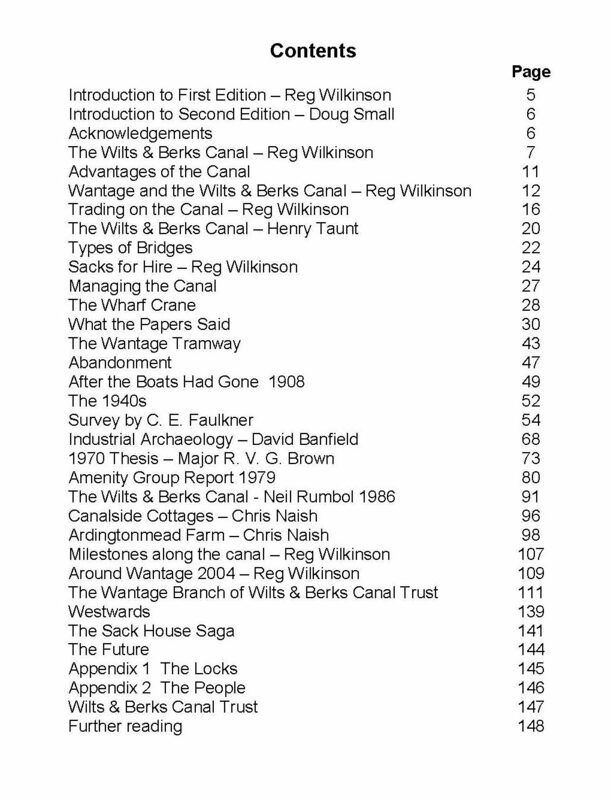 Most importantly, however, it includes an updated version of Reg Wilkinson's booklet, A Waterway to Wantage, a history of the canal around Wantage. Reg had been a friend of Jack Dalby, author of The Wilts and Berks Canal, first published in 1971, for which he had provided a map and several photographs. Doug had originally intended merely to publish an updated version of A Waterway to Wantage but realized that a lot more information could be gleaned from a variety of sources about the canal which had never been gathered together and published as a single book. Since Reg Wilkinson had been his inspiration, he therefore set about collecting additional information from him which also forms part of this book. From then, the book simply took on a life of its own. Particularly interesting is the last part of the book which catalogues the achievements of the East Vale branch over the years, complete with then-and-now photographs. Because the towpath is a public right of way for six miles either side of Wantage, the branch has always assumed responsibility for maintaining it and keeping it clear of any obstructions for the benefit of the local populace. In fact, Doug mentions that one of the branch's first restoration projects was the reconstruction of the tailbridge over Grove Common Lock which carries a public footpath from Grove over to Charlton village, near Wantage. Other major projects include the reconstruction of Childrey wharf and the transformation of the sackhouse on Wantage wharf, restored by developers, into a small museum for the canal and the Wantage tramway. He also mentions that the branch has now turned its attention towards the rebuilding of the Childrey bridleway bridge between West Challow and Childrey, for which planning permission has already been applied. The East Vale branch is grateful to Doug for highlighting its achievements and for ensuring that they become more widely known. Although, at first glance, A Waterway to Wantage - Then and Now may appear to be a disparate collection of information about the canal and the Wantage Tramway which shared a terminus with the canal on Wantage wharf, it reveals the canal from a multitude of aspects over two centuries and gives the reader an insight into how it was viewed by officialdom and ordinary people alike during that period. Doug has done an excellent job of bringing together many nuggets of information about the canal which the average amateur enthusiast would not even have been aware of.